Buildex® first again with Teks screw specifically designed and manufactured for fixing non compressed Fibre Cement sheeting 6 – 12mm to steel battens 0.9 – 4.0mm. Featuring the latest Tek® drill point and Phillips drive to reduce the need for pre-drilling, and a lip feature designed to prevent over drilling and allows for a flush finish. Patented lip feature, ensures the screw will stop as soon as it makes contact with the surface of the board. 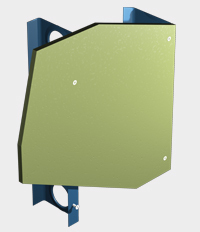 Prevents overdriving but allows for minimum embedment and a flush finish. 1. Can be installed using either a battery powered or mains powered screw gun. 2. Recommended that a nose cone should be used with screw gun. 3. Use a Buildex® No. 2 Phillips Recess drive bit. Non Compressed Fibre Cement Sheeting 6 – 12mm to steel battens from 0.9 – 4mm. Results may vary subject to types of sheeting used.